The Cantonese Really Know How to Eat! 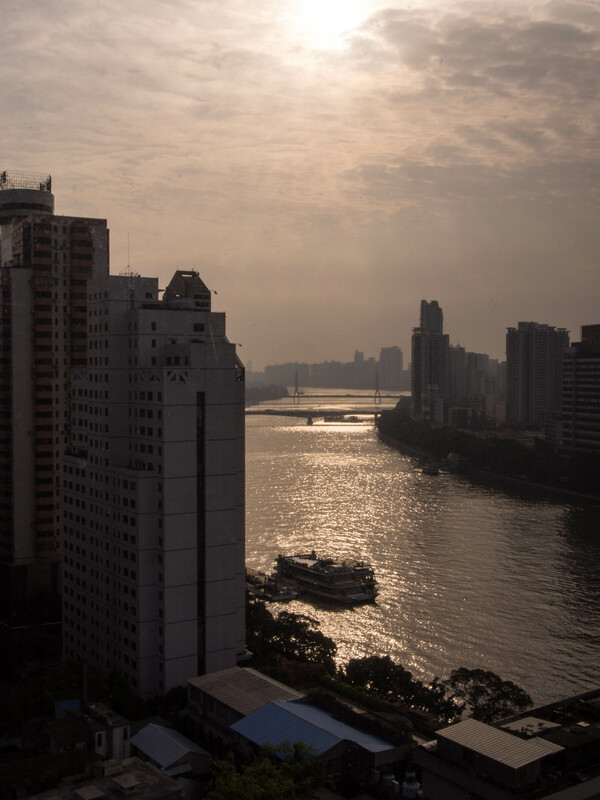 I’ve been in southern China, specifically Guangdong Province, for the past couple weeks and was reminded of how seriously the Cantonese take their food and eating. Back in the early 80’s I lived in Hong Kong and learned first hand how much the Cantonese love to eat. Food was everywhere and people ate all day long it seemed, and late into the night. I remember once in the early 90’s I was in Guangzhou for a couple weeks working on a Cantonese language project. One night my Cantonese colleagues and I finished up our work at about 11:00 pm. I had a flight out the next morning at 7 am and figured I’d head back to my hotel and go to bed. But they had other plans. They suggested we go out and get something to eat. Why not? A little snack would be good. Boy, was I wrong. We found a small restaurant with tables spilling out onto the sidewalk. The dishes kept coming and coming. We ended up with 12 different dishes and ate until 2:00 am. 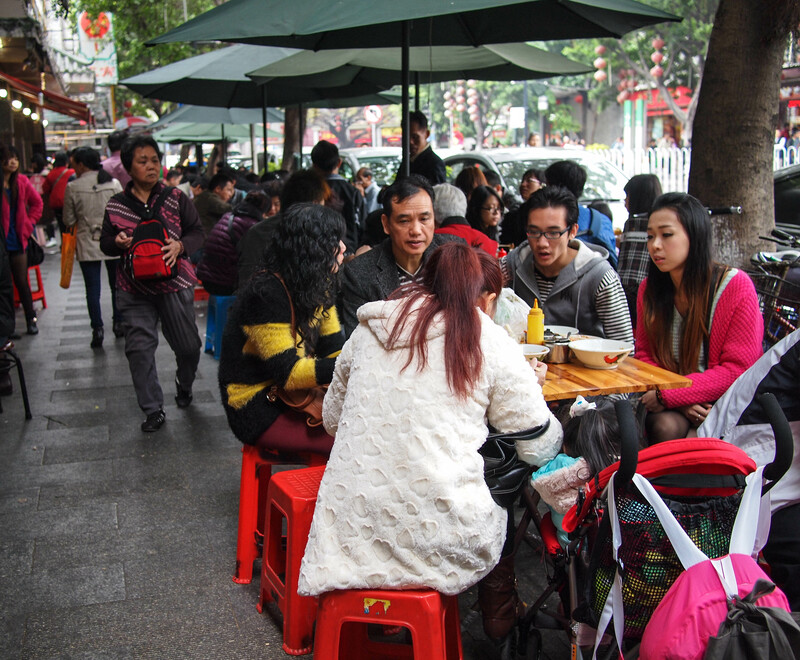 One the first things the foodie may notice in Guangzhou is that there is food and eating everywhere. 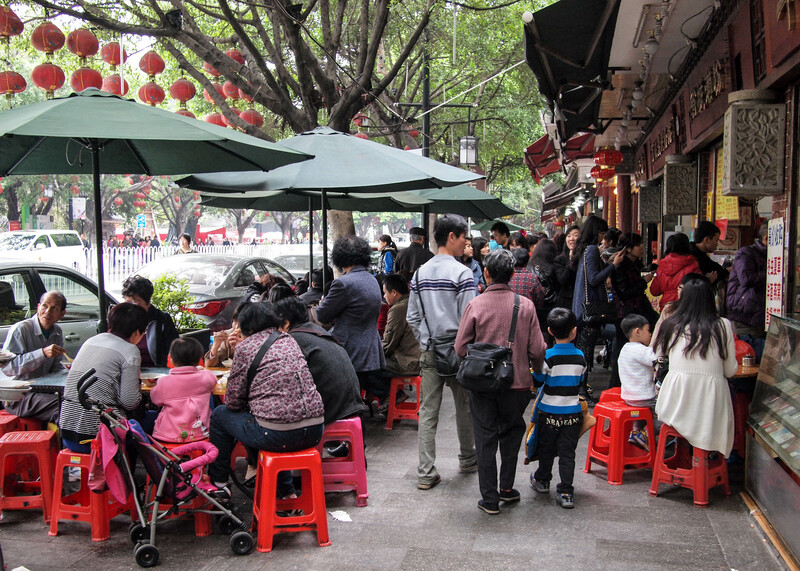 It is common for small restaurants to set up tables along the sidewalk and at the best places people will be lined up waiting for a table. People eating and lining up to eat. Even white tablecloths at some places. 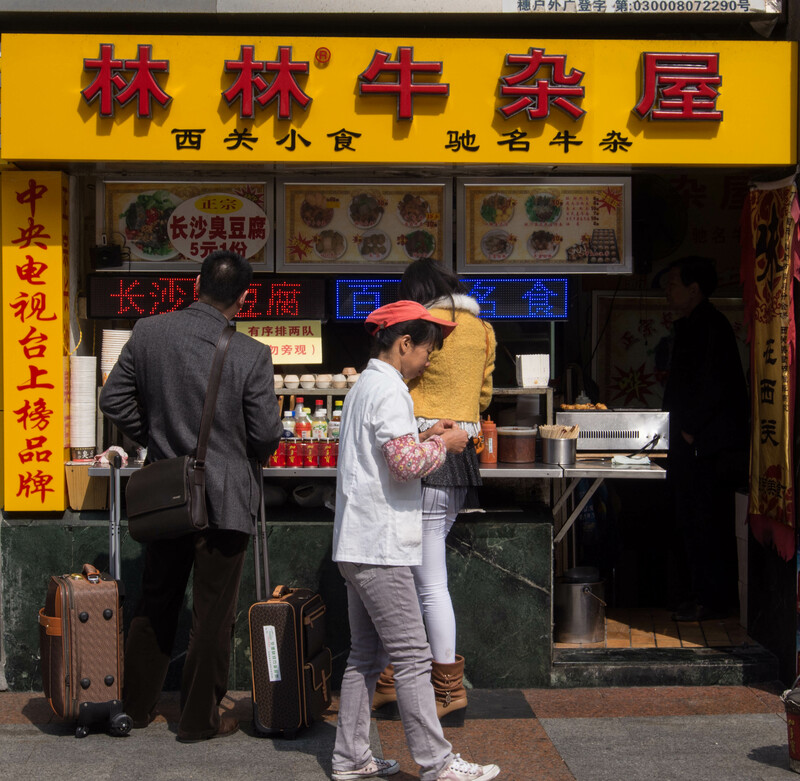 The number of restaurants in Guangzhou is staggering. 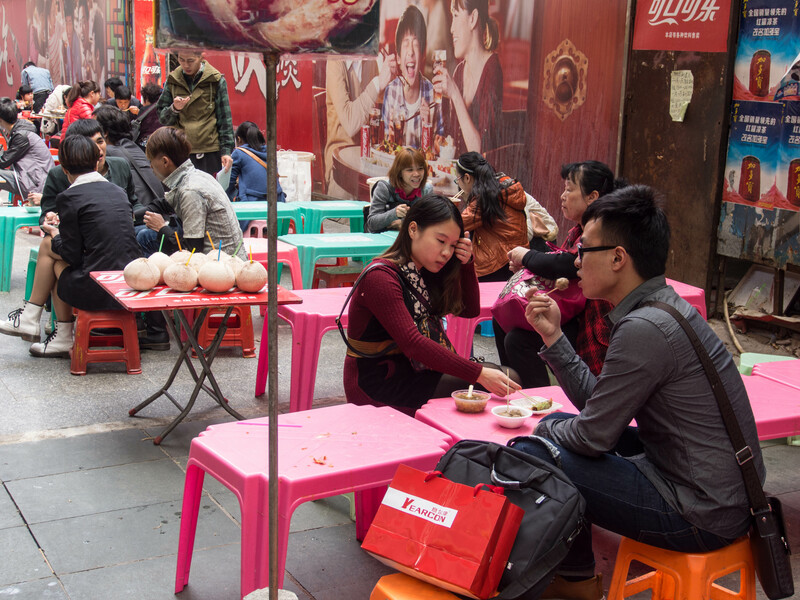 Street food is also pretty serious business in Guangzhou as well. 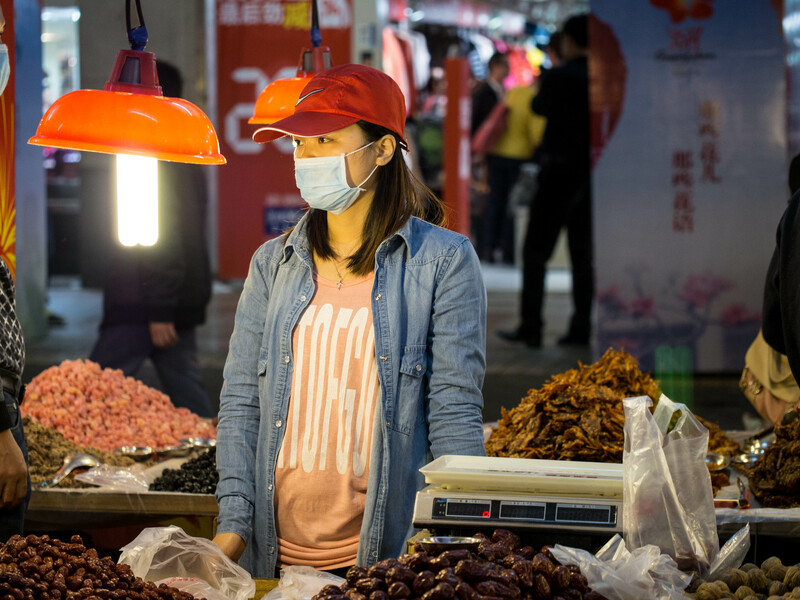 Busy pedestrian malls, night markets, near bus and train stations, and shopping areas are packed with vendors selling snacks from their carts. 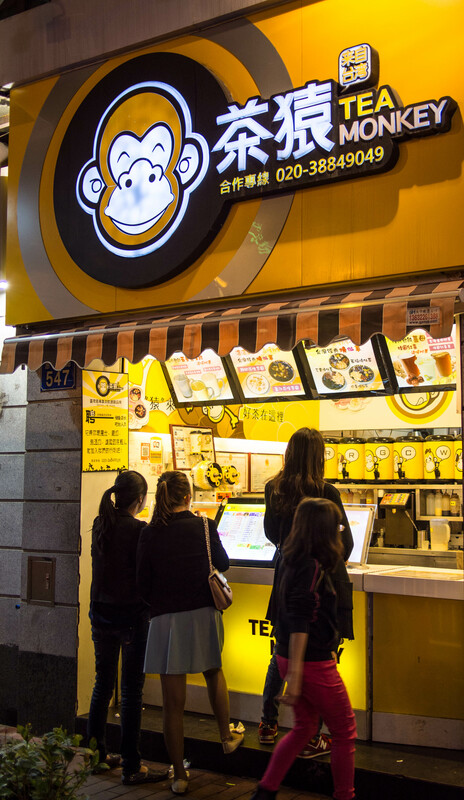 The streets are lined with countless small shops selling everything from milk tea to ice cream. And everyone is eating. Milk an bubble teas are very popular. Dried seafood is a very popular snack in Guangzhou, especially squid. Of course Cantonese food is probably most notable for its dimsum and the dimsum in Guangzhou is spectacular. 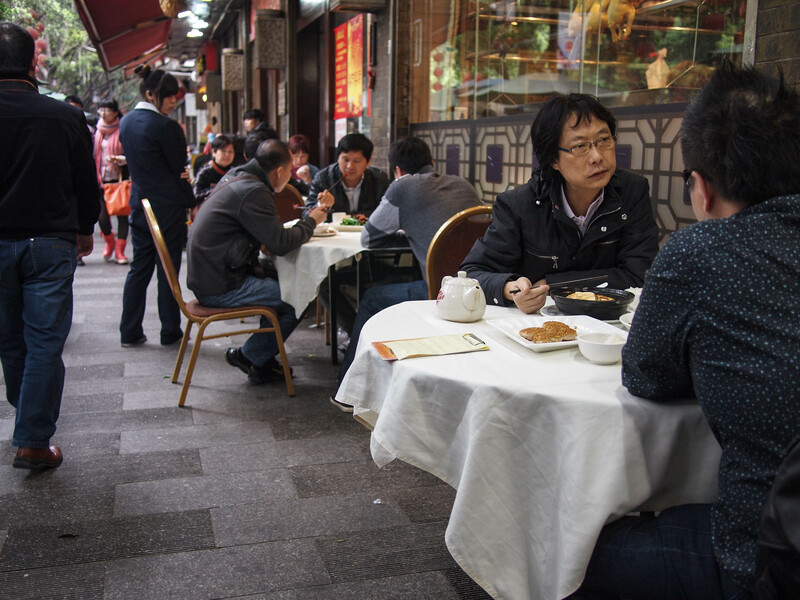 I will be doing several more posts on the eating scene in Guangzhou as it is one of the major cuisines of China. Also watch for an upcoming posts on eating in Chaozhou and Taiwan.